"Noel Guerrero, 28, served in one of the hardest hit military units in Afghanistan, the Second Battalion, Seventh Marine Regiment. One night last November, Noel — now 28 and living in San Diego — tried take his own life. Manny Bojorquez, a close friend and fellow 2/7 Marine who lives hours away, called the police. He saved Noel's life at the risk of their friendship. 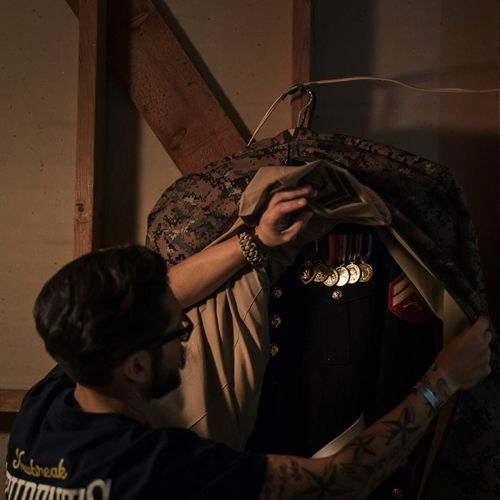 @heislerphoto, a @nytimes staff photographer, worked with the reporter Dave Philipps on a report about suicides among the @Marines of the Second Battalion, Seventh Marine Regiment, which has endured 13 suicides in the unit since 2008. @heislerphoto spent a few days with Noel. "One evening, as we returned from a gathering at his church, he pulled his car into the garage and I noticed a garment bag hanging in the corner," @heislerphoto wrote on the #lensblog. "He unzipped the bag to show me his dress blues, a row of medals pinned across the breast. It's where he keeps his Purple Heart, he said. Tucked away in the garage." #USMC #MarineCorps" By nytimes on Instagram.